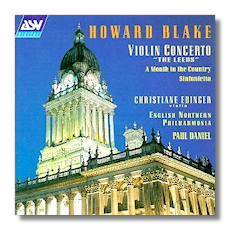 The violin concerto is an immediately likeable work with some exhilarating violin writing and orchestration. A Month in the Country uses material from a film score and there are echoes of Vaughan Williams in Tallis Fantasia mode and Britten's Frank Bridge Variations. The sinfonietta is edgier music, giving plenty of opportunity for the individual players.